Ahoy Hill hipster! It’s been an exciting time here On Bunker Hill. Through the grace of George Mann’s family, the other day Kim posted twenty-one images of BH in living doomed color. One of those featured the Sunshine Apts. with the Hill Crest looming o’er; a few days later the esteemed Jim Dawson posted all about the Sunshine, including a new Mann image that showcased a year’s worth of growth where the Hill Crest once stood. And now, for your edification and delectation, more. I begin my post as did Kim not with shots of Bunker Hill, but with a George Mann image nonetheless. This is the Sentous Block, designed in 1886 by R. J. Reeve; the same year Reeve designed the U. S. Hotel and the Phillips Block. Louis Sentous was one of the great French pioneers of Los Angeles who’d arrived penniless, panned for a little gold and became a successful cattle rancher, trading meat and dairy at the Plaza until he bought the nearby piece of property (bounded by Sunset, Spring, Main and Macy) that was to bear his name. 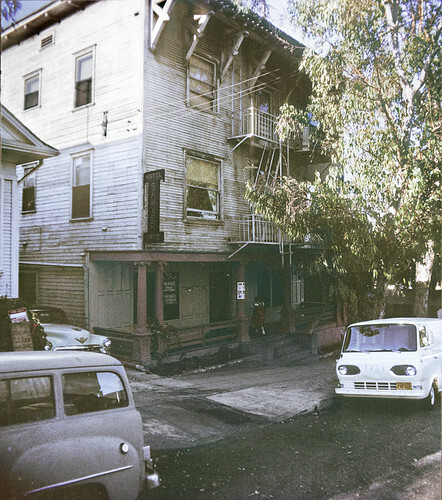 The Sentous Block is best known around noirsville as where Mike Hammer cruises over to the Jalisco Hotel in Kiss Me Deadly; it also contained the Bamba Club, which doubles as the Round-Up in Criss Cross. 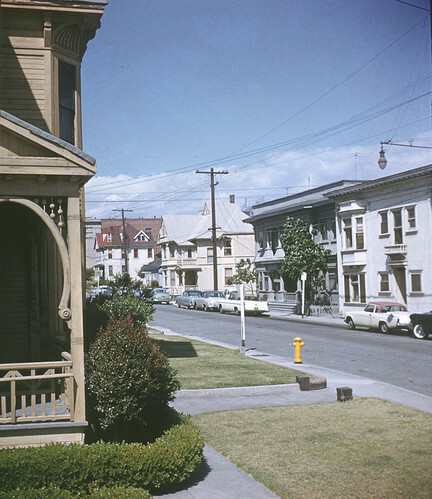 (Both on the Spring St. side of the Sentous; our image shows the Main St. side.) For more than you would ever want to know about this, go here (seems like contributor Beaudry needs a girlfriend or something). Louis lasted until 1911; his building til 1957. Just goes to show. Not everything ornate that was torn down in the last fifty years was on Bunker Hill. You owe it to yourself to learn the names and faces of the Amestoy Block. The Bath Block. The Gollmer Block. The Wilson Block. The Stimson Building. The Westminster Hotel. The Martz Flats. Ad nauseum. But on to Bunker Hill! Nothing says deep arcaded entry and red-tiled bell tower like “Astoria”. Yes, one can not help but marvel at the incongruity of Bunker Hill naming systems. I wrote earlier in OBH about the red-tiled onion domed Minnewaska, the fairly Franco-Renaissance Sherwood, and while it hasn’t been explored yet, the decisively Mission-styled 1904 Mission Apartments at Second and Olive spent much of its young life known as, of course, Castle Craig. In any event, of the Astoria much has been said. Next to the Astoria is the 1916 Blackstone Apartments, with the nice Beaux Arts garlands upon’t. 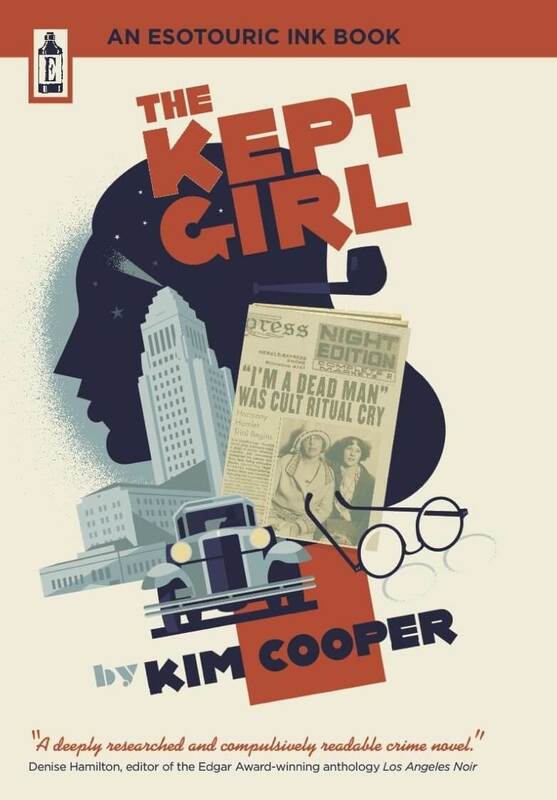 Not a whole lot happened there, an ex-cop caught violating the Wright Act, and there were some lady bootleggers; while the Widows Protective League Los Angeles Branch Council met at the Blackstone, a widow took poison and offed herself there the very same year (1929); and Ross Page, younger brother of the widely-known “Farmer” Page, was busted there by the vice squad while running two bridge games and a poker game in August of ‘25. 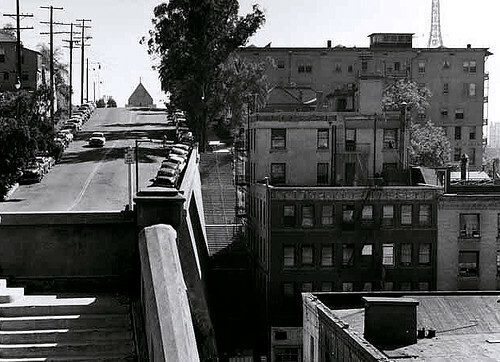 That din emanating from Bunker Hill these days is the relentless pounding of the jackhammers tearing down the ancient Blackstone Apartments, 244 S Olive St., next door to the top of Angel’s Flight. 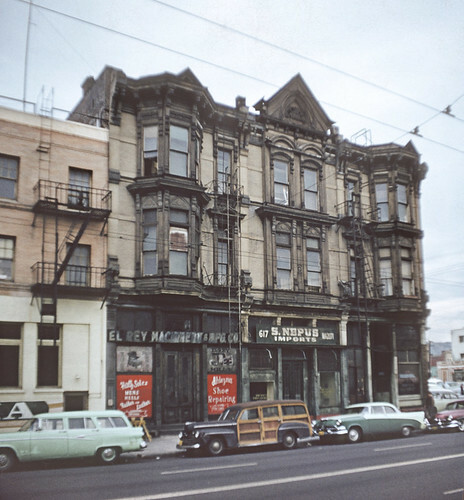 Until the demolition crew went to work on it, the Blackstone was nine stories high, counting the floors from the back entrance in the alley, which was kept locked. However, if you entered on Olive St., as most people did, you were on the third floor, and from there it was only a six story building. I learned this many years ago in visiting a departed colleague, J. Farrington Barrington Arrington, who lived there. And so another quaint landmark passes and now, when I go into a building on what purports to be the main floor it will really be the main floor, not the third. Progress marches on. The tree in our color image is the tree dead center above, and the large building jutting out to the right of the frame (Richfield tower visible behind) from Hope and plunging down the hill toward Flower, that’s the Sawyer. We stand adjacent to a bit of spindlework at 333 South Bunker Hill, between, of course, the Salt Box behind our left shoulder and the Castle on the other side of 333. Whitey there on the right with the dentils is 326 South Bunker Hill, but its real address is 325 South Grand, as this is the backside of the Kenneth Apts. 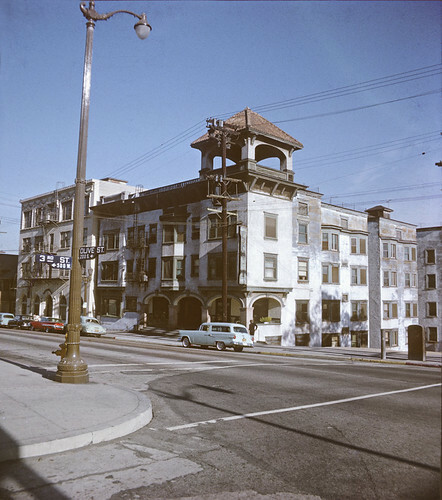 Its blue neighbor with the deep columned entry is 322/318; it had a non-conjoined counterpart of 319/323 at Grand and together they were known as the Alta Cresta. Its beige neighbor to the north with the porch is 310 and there’s a small house behind it that’s either 306 or 302 South Bunker Hill. And the big brick building behind that is the backend of the Alto Hotel, 253 S. Grand. At least it’s a mystery to me. It’s not within a gallon of Ethel of the DT, of that I’m pretty certain. 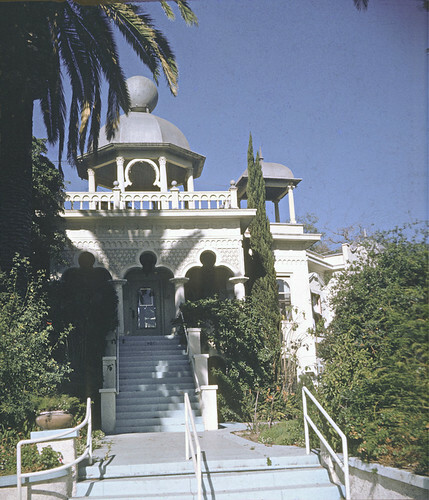 Mann shot all over, Point Loma, Catalina…so here’s this Victorian Exotic Revival that’s going for something Indo-Moorish, though what that is I can’t say – do you know? There’s what appears to be a “701” on her stairs. OBH readers are the best and the brightest: whence came this sweetheart and whither did she go? Outdoor Toilets on Bunker Hill? Hey Buddy — Got a Match? Two New Mann Images — Final Days of the Flight!